Every serious trainer aspires to build an aesthetically-tapered physique, to create the illusion of sculpted shoulders and wide lats descending into a tight waist. The truth is, that v-taper is largely based on genetics. So, if you aren’t blessed with those traits, you must focus on musculature characteristics that can visually enhance the hourglass effect. Creating a narrow waist, to the extent determined by your body composition will rely heavily on overall fat loss methodologies. We can attack this aesthetic goal from a variety of angles. 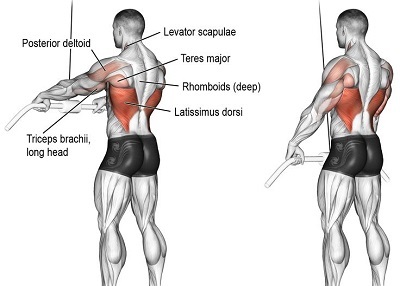 Placing particular emphasis on developing wide lats will visually enhance the perceived disparity. The Latissimus Dorsi represents the broadest muscle of your back, with a wing-like structure spanning from humerus down to your posterior iliac crest. 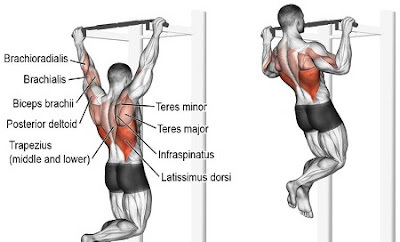 Developing this behemoth creates a productive cycle of growing lats and a shrinking waist, as each continues to perpetuate the other in opposing directions. Although we often seek training advice from those who already embody the physical traits we seek, it’s wise to listen to the advice of someone who has developed a relatively impressive physique in spite of genetic limitations. For years my lats were nonexistent. Here are four exercises that I do on every back day without fail. Keep in mind, I’ve trained back at least three days a week for the past two years. As always, you want to start with the minimum required a volume to still achieve adaptation benchmarks. Work Sequence: Wide Grip x 10 reps, Neutral Grip x 10 reps, Supinated/Reverse Grip x 10 reps. You should be approaching failure on each grip, as you’ll naturally be stronger with each subsequent variation. Tip Use a free standing pull up apparatus or if needed, an assisted pull-up machine. The assisted pull-up machine will help you continue to perform full repetitions if you start to fail. Still select assistance appropriate for maximum. Work Sequence: 4 x 8/15 dropset. In most cases, when load modification simply requires the movement of a pin, we will incorporate some intensity technique (ie. dropsets) in an effort to capture stimulation across fiber types and metabolic demand. Tip: Utilize a close-grip row attachment (V-handle), place a stepper (or any flat stationary apparatus) approximately 6 – 10 inches in height on top of the bench. This will be your modified seat height, creating a natural plane of movement leading with your elbows below your rib cage, finishing with hands touching each oblique. Tip: Vary attachment and equipment with each subsequent workout: cable straight bar, cable rope, cable v-bar and dumbbell. 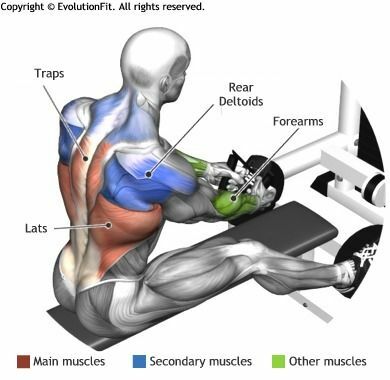 For each variation, you should maintain elbow angle (soft elbow, nearly straight) throughout the movement, isolating contraction of the lats through the concentric and eccentric phases of each repetition. If you simply incorporate these exercises and the correlating work sequence into your existing back routine, I can assure you results will ensue. These four exercise take a number of critical factors into play: stimulating lats from a variety of angles, managing limiting factors, incorporating compound and isolated movements while achieving volume across different load intensities. Next ArticleThese Leaves Produce Insulin Like Crazy Thing, Clean Kidneys, Arteries And More. Do not Expect To Erase It And Do It Now!